Abstract : Most real-time embedded systems are, by nature, multitasking solutions to real-world problems. They typically deal with the interface and control of multiple eternal devices. The different parts of these systems usually run at different priorities and with different run-time characteristcis. The notion of multiple tasks or threads being active in the system at the same time is common. Many of these real-time systems are deployed on a set of microprocessors in a distributed architecture. Designing a solution for this type of problem requires a view other than object oriented systems. This document describes the component system we developed. It describes how it should be used when programming components and it describes how the wystem itself can be adpated. The document is split in 4 parts. The first part describes what a component is and gives a good idea how to think about components (at implementation level). This part is based upon the 'Component Working Definition' deliverable. This section also contains a description of the Component System and what it is supposed to cover. The second part is a discussion about 'event based' vs 'thread based'. The third part describe how we actually can write a component. This is mainly a tutorial. The fourth part describes how we can use and tune the component system to suit our needs. The first part describes what a component is and gives a good idea how to think about components (at implementation level). This part is based upon the 'Component Working Definition' deliverable. This section also contains a description of the Component System and what it is supposed to cover. The second part is a discussion about 'event based' vs 'thread based'. The third part describe how we actually can write a component. This is mainly a tutorial. The fourth part describes how we can use and tune the component system to suit our needs. In this definition a distinction has to be made between a component blueprint and a component instance. A component blueprint is a description of a reusable software element; a component instance is an instantiation of this description. A component blueprint doesn't have a state, a component instance does. It also doesn't make sense to talk about the runtime properties of a component blueprint; only component instances have runtime properties. This distinction is important for a clear definition. The term component is more general; by using it we mean both aspects. Component instances are not objects. And as a consequence, component blueprints are not classes. When a component is implemented, it will probably use different objects to perform its functionality (of course in the case an OO language is chosen). Therefore some books talk about components as if they were big objects. This is true to some extent, but limiting the component definition to this would be wrong. A component instance should be thought of as having its own code & data space and also its own reactive behavior. This is necessary to have the ability to use different synchronization principles and make components reusable. A component worked out, thinking it has its own control flow will be more general, than a component which enforces certain calling strategies upon other components.1 Or, a component written in the assumption its memory will be accessed by other components is more specific than a component which doesn't share its data via these kinds of techniques. As described in an earlier deliverable we distinguish 4 levels of component abstraction. (syntactic, semantic, synchronization and quality of service level). This document deals only with the first, syntactic, level. The component system is the infrastructure (framework, architecture or kind of operating system), which makes component instances work together, which glues them and creates a homogenous environment for them. The component system can be seen as the middle-ware which connects different components and which makes them work together. To put it differently: the component system provides the streets while the components are the cars driving on it. Makes components work. The component system can create and destroy component instances and is able to start and stop component instances. The component system can have support for introspection. When working with components we need the ability to find, name and rename components. These abilities should be provided by the component system. Furthermore, sometimes it is necessary that a client can query a component about its services. Mostly the client is bound to the component's interface at client construction time (e.g. when the client is compiled). When introspection is possible, the client is not bound at client construction time, but it can dynamically (at runtime) find the services of a component. This can be compared to the reflection mechanism in Java. Abstracts the hardware and the operating system such that all components can run in the same environment. The component system offers a standard interface towards all components and offers device dependent components. Handles message passing between components: If a component wants to make another component do something, or whenever the state of another component has to be changed, a message is send to the component in question. Components can send messages to other components using a reference (which can be obtained by using the unique name of the component). The component system takes care of sending data (over a network for example), calling the right function on components and eventually other ways of passing messages between components. This includes changing the data format if necessary, as is done in CORBA. Nevertheless, the component system is not necessarily a distributed environment. The component system handles the scheduling between components. Because components are thought of as active entities it is necessary to map this view to a real operating environment. This is done by the component system, which ensures priorities of messages between components, which takes care of (hard) real time constraints and scheduling in general. The component system has some standard glue components to adapt interfaces between different components. For example, a certain component can return a callback with a specific name, whilst the receiver expects the message with another name. This can be done by certain glue components. The component system should help in debugging by checking whether interfaces are used in the right way. The component system understands the synchronization interfaces provided by the components and can automatically check whether the right calling sequence is used. Another possibility is logging all sent messages. These things are offered by the component system in the form of a runtime environment (the component system runtime) and a precompiler which transforms 'component code' into suitable Java code. We added a precompiler because it allows us to change the component system runtime without the need of changing all the source code written so far. The precompiler also offers us eventually a possibility to compile to other languages instead of Java. The component system has a difficult task to offer all these things (especially glue components, the transparent distribution layer and last but not least the timings and timing constraints) together. As such we decided that we needed an very flexible open meta message protocol. The component system offers this in the form of an asynchronous message delivery system. The choice of an asynchronous event handling system versus a process based system is describes in the next section. Deadlocks, which is the result of a proces waiting for a proces which direct or indirect waiting for the original process to do something. Data sharing, which is a problem in distributed environments. If a piece of data is transferred to another machine its state is independent of the original state. This can also lewad to unexpected behavior. Race conditions, which means that the behavior of a program depends upon its execution speed. It is clear that these problems cannot be esaily solved. Solving these would be rather interesting (to put it eufemistic), but it is not the scope of the project. To illustrate our choice we will describe both methods, together with their standard solutions, advantages and disadvantages. As long as we program processes which minds there own business and doesn't require too much interaction everything is peachy. We can write programs as we would write single threaded programs. If we program correctly and implement a well designed locking strategy into an application we might not have to much dificulties. At the time being this way of working is probably much more performatn than using an event based method. Multi threaded programs tends to explode in complexity very quickly if we use a fine grained locking strategy. The complexity of multi threaded programs can be avoided by using a very course locking strategy, and in fact by sequencing the program. In this case threads are useles. Multi threaded programs are difficult to implement in distributed environments because we need some kind of data sharing between processes. Processes can wait for each other, which can very easy lead to deadlocks. This non local property cannot be solved by one of the communicating processes because none of them understands in what kind of environment they're put to use. Concurrency problems are difficult to debug because they are difficult to repeat. Priority systems in multi threaded environments are troublesome, because the priority is most of the time not linked to the functionality which is being served. Summarized: components have their own code/data space. Components communicate by means of sending messages (events) to each other. Components can only handle messages, they cannot wait for each other. Since we cannot wait for another component to do something we need to change the way we program. We now have to think asynchronous instead of synchronous. Larger components are definitely easier and more natural to write because more time goes into the logic of the component, not into the interaction between components. Makes it easier to debug an application because we can use a record/replay component system which can repeat a sequence of events without too much problems. Avoids polling loops and badly written code. Everything is interrupt driven and as such only acts when needed. If we specify constraints upon events we can do runtime constraint checking upon the sequence of messages. We can use a very fine grained priority system which is closely linked to the functionality being served. If we specifiy the correct constraints we can deduce what has to happen before a certain action is executed. (component A is waiting for component B and component C before it will do action a). This kind of backward chaining is very difficult to write down in event based methods. The programmer need to think about how to write their components and very small components are wonderfully hard to write. Without an extra burden upon the programmer the system can understand what a component is waiting for. This extra semantic information is very useful. The size of the code becomes 4 time larger for small components. Altough a drawback, this problem dissolves if we start writing bigger components. We can never wait for another component to change its state. Slower than thread based methods. Events doesn't solve the standard concurrency problems as one might tend to conclude. This section documents the current version of the component system. Since the component system is in continuous development, changes are to be expected. Nevertheless, this documentation gives a good insight view how components should be written and why the design is as it is. Throughout this manual we will built a small application. The application will be a webserver component which communicates with other components acting as .cgi scripts, answering to certain urls. These components are called UrlHandlers. 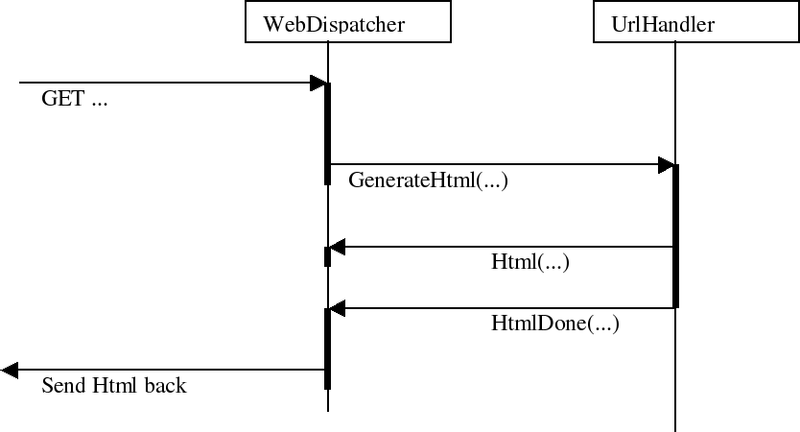 The webserver itself is called a WebDispatcher which dispatches incoming 'GET' requests to the correct UrlHandler components. These in turn will answer with a generated webpage. Before reading the manual some things need to be cleared up. We need to define a component at the implementation level. This error should be reported immediately to werner.van.belle@vub.ac.be. This means that you are using a certain kind of expression in the .component file which is not yet supported. For example, if we try to use a goto statement, the precompiler will break. The following sections contains a step by step guide how we can write these UrlHandler/WebDispatcher components. Component blueprints are named according to the Java naming conventions where the name clearly states the purpose of the component. This name is always capitalized at the beginning of the identifier (as if it were a java class). Furthermore the identifier has a capital at each start of an English word. Component instances have also a human readable name, stating clearly the purpose of the instance. Abbreviations are capitalized at the first letter. All other letters of the abbreviation should be lower case.7 Underscores and other strange characters are normally not allowed unless used internally in a single component. Instance names given to components are used to refer to them and send messages to them at runtime. The name should be chosen in such a way that it defines the use of this instance in the system. A component is not equal to a java class. A component is represented by an instance of a java class, nevertheless the component can use other classes to help it to perform the tasks it is constructed for. A components variables and other structures to which it relates are owned by the component and should be considered as such. For example, if a component has a reference to a linked list somehow, this linked list is 'owned' by the component and only by that component. As such, we obtain a set of code/data islands at runtime which interact with each other at runtime via the component system. We have two ways to declare something to be a component. At runtime a component is represented as a java class which directly (or indirectly) inherits from the Component class which is available in the component.system package.8The component base class provides some basic functionality such as sending messages, handling messages, initializing, retrieving the components name, assigning message handlers and so on. Bottom-line is that if we want to write a component the easiest way is to extend from Component. Components may be constructed by inheriting from each other to add functionality to the other component, as long as we don't have any unanticipated code/data sharing via static variables. 9 For example, there are a number of standard glue components provided which offer you a certain functionality which you do not want to implement every time you write a component. The SubscriberDispatcher glue component is a good example. This component understands subscribe request and is able to dispatch a message to other components, depending on the subscribed components. We advice using the componentclass keyword because it allows us some flexibility in generating code. For example: It is currently rather difficult to make a standard java class (lets say Frame) behave as a component. The trick we use around the impossibility to inherit from Component is using a bridge variable to some component-representant. If you use the componentclass keyword this code might be automatically generated in the near future ! When creating a component system, the ComponentSystem will send an Init message to our UrlHandler after creating the component. If we want to respond to this message we have to implement its behavior somewhere. We do this by writing a public synchronized argument-free, void-returning method (message thunk for short) in the AccessCounter class. All messages which arrive for a component are automatically translated into method calls in the Java class. Notice that the naming convention for messages is the same as for Java method names, except for the fact that component messages starts with a capital. A component message never has any parameters declared in its signature. For more information on how to pass information to and from a thunk see the paragraph on Passing/Retrieving Parameters. The precompiler offers a special keyword: message. This keyword automatically expands to public synchronized void. Sending Messages to Components: .. The AccessCounter should be able to respond to GenerateHtml messages. It should do this by sending a webpage to the WebDispatcher. When all HTML parts have been sent, the accesscounter should send a HtmlDone message. Let's have a look at how we can send this last message. If we have stored the name of the component in a webserver variable, we can send the HtmlDone message to the webserver by using the special .. notation. .. means 'send the message (after the ..) to the component (before the ..)'. private static final String webserver="WebDispatcher"
The reason why we are using a .. notation is to make the difference between synchronized sends between objects and asynchronous sends to components. If we want to send message to the WebDispatcher using the component system runtime without going through the precompiler, we can use the sendMessage method (defined in the component base class). The parameter passing/retrieving mechanism is of a strange kind. We do not rely on the java standard parameter passing mechanism since it is too strict. The standard parameter passing mechanism makes it very difficult for us to write glue components and to transform messages which are being send between components. The current mechanism works incrementally. Before sending a message to another program (By using the .. notation or the sendMessage call) we create a set of parameters, step by step. We do this by adding fields to an 'outgoing message' record. At the moment we actually has sent the message this set of parameters is cleared and we can start creating a new set of parameters. This example illustrates some possible uses of this mechanism. Below is another example of the getters and setters. This example is called from an interrupt handling component. The socketInterruptHandler will send Update to the WebDispatcher at the moment there is a new incoming connection. This piece of pseudo code is what could happen when somebody connects to our WebDispatcher. If we want to use the runtime immediately we can use the getField and putField method calls. These methods are made available in the component base class. returns an Object. Name should be a String. with name to be a String and value to be an Object. The putField methods must be invoked before invoking the sendMessage method. The order of the putField commands doesn't have any effect. We have to change all components which will ever connect to our Httpd-Component whenever we change the interface. We don't have data hiding anymore, if a certain UrlHandler decides it wants to write immediately to the socket, we're screwed. To support this we have created a special field (with special field notation), called the 'Hidden Fields'. A hidden field is a field which can be passed to another component. If this other component, in handling the message, decides to sent a message to somebody else, this hidden field is implicitly copied in the outgoing message. If we use the precompiler, these fields are annotated with reversed brackets. We use >< instead of <>, we use >:< instead of <:>, and we use >|<, instead of <|>. All the fieldnames we choose are automatically prefixed with the name of the component. This is to avoid nameconflicts. Example: The example below illustrates how we could use this to make the Httpd-Component work, without having to change the UrlHandlers interface. Retrieve hidden parameter with name name. Name should be a String. Value should be an Object. This method will create a component (using the single-String-parameter constructor of the class) and send an Init message to the component. So if we want to initialize a component, we should do this in the Init method, not in the constructor. Using the constructor is a bad way to initialize a component because it is too Java specific. Nevertheless, this simple creation/initialization scheme has some drawbacks. First of all, we have to use fully qualified classnames instead of component blueprint names. A question which arrives from time to time is whether components can have their own thread, whether they are active, passive or how they position themselves in a multi threaded environment. The answer is simple. In fact, components are completely passive entities that do not have their own thread. Whenever a message arrives for a component the component system will call the component's handleMessage in a thread owned by the component system. This thread should be given back to the component system as soon as possible (after handling the message). A component should never wait in a message which is being handled. Defined as such, components are passive. On the other hand, components should be designed as 'active', so what will it be. We propose to use the term 'Reactive', because they react on incoming messages and go to sleep afterwards. This arises the question how we can make real active components which have their own thread of execution. This is not necessary. The only reason why we would want to have a thread is to program in a synchronous way, which is the thing we do not want to do here, or to wait for some event to happen. The latter case is in fact a sort of interrupt handling, but doesn't require full thread support. Because this is a thing which is always very environment specific and because these kind of interrupt handlers require a very specific timing behavior it is necessary to integrate them tightly into the component system. Below are two examples of already written interrupt handlers. The first is a SocketInterruptHandler which listens on port 8080 to accept incoming connections. The second one is a TimingInterruptHandler which sends a notify every <x> milliseconds. This code illustrates how to use a Java thread to wait for a certain condition to happen. (for a certain interrupt if you want). Whenever the interrupt arises we notify all subscribed components by calling notify. We have seen how we can write a threaded InterruptHandler which uses a thread to wait for a certain condition to happen. This is, however, sometimes not needed, and we can use Java supported interrupts to make an InterruptHandler. This section contains some 'advance' topics in the sense that they are pushing the use of the component system to its limit, or they contain some unexpected behavior of the component system which should be taken into account. the name of the sending component. the name of the component which should receive the message. This is the expected behavior, and is possible. This is also possible because component C sends a message (A2) and component A sends a message (A3), both components are concurring to send a message, so one of them will have priority. Thus, it is possible that A3 arrives at component B, before A2 arrives. A2 + A3 + A1; A3 + A2 + A1 and A3 + A1 + A2 are incorrect because A3 arrives before A1. Another big problem of the component system are race conditions. The component system tries to make parallelism and concurrency as transparent as possible to the component programmer. This implies that he might think everything is peachy when writing components and passing parameters. Of course, this isn't. Components are always accessed by one thread at a time. Components should not have their own thread (to avoid timing problems, priority problems in the scheduler and concurrency problems upon the components state). Nevertheless there is an unavoidable concurrency in the objects which are shared between different components. Normally there shouldn't be any of these objects, but in practice this will happen immeditaly at the moment you send a message from one component to another. Leading to unexpected behavior of the program. For example, suppose we pass a big database object from one component in a message to another component. Now both components can access the database object concurrently. The database probably doesn't know this, and both components will think they have unique access to the database, leading to race-conditions, or deadlocks. The problem in this example is the fact that we allow both components to change the database. This should never be allowed. Passed messages should be treated as read-only and should be copied in a perfect world. This rule is enhanced by the fact that whenever we work in a distributed environment we will need to copy the data from one processor to another and writes upon it will be completely impossible. Currently, we are thinking to add the notion of ownership to the component system. An event/object is owned by only one component. All other components which can access this object can only read it, NOT modify it. This is the complete example we showed in fragments throughout the manual. The HttpDaemon example consists of a number of components. We have the Httpd-Component (the main component if you want), the AccessCounter-Component, the Clock-Component and the HtmlSender-Component. Furthermore we have the interrupt handling component, SocketInterruptHandler. This example should be looked at very careful, because it illustrates the use of the hidden parameters. We see how some hidden fields (a buffered writer, called 'Dos' and a socket, called 'Socket') are passed to the UrlHandler. When the UrlHandler sends a message back to this instance of Httpd we will now what socket and what buffered writer we were using. This is probably the most simple example of an UrlHandler. This very small piece of code is a component which only responds to GenerateHtml. This example shows how to declare something as a component. How to handle messages and how to send back a message. This component illustrates the Init method very clear. The init method is send by the component system, immediately after creating the component. This example illustrates how messages are constructed. In this case, we first construate the 'Data' field for the 'Html' messagge. If this is done, we actually send the message. Currently the component system doesn't offer a good main component. This is due to a lack of time. Nevertheless, below is an example how we get this thing to work at the moment. The glue components provided by the component system should be generic well-designed components with as little as possible overhead towards the global system and which can eventually be removed when compiling. We have made a start by offering some glue components. We know that these are not as flexible as they ought to be, but at least they can form a base of usable/reusable glue components. At the moment a Sync operation is invoked, we check whether we are already waiting or not. If we are not yet waiting we go to a wait state. If we are already waiting we send a Synced message back to both parties, which can now continue with their logical execution. Another standard glue component is the dispatcher component. This component will keep track of other components which subscribe themselves to a certain string. Afterwards we can easily retrieve the name of the component which was subscribed to a string and send a message to it. 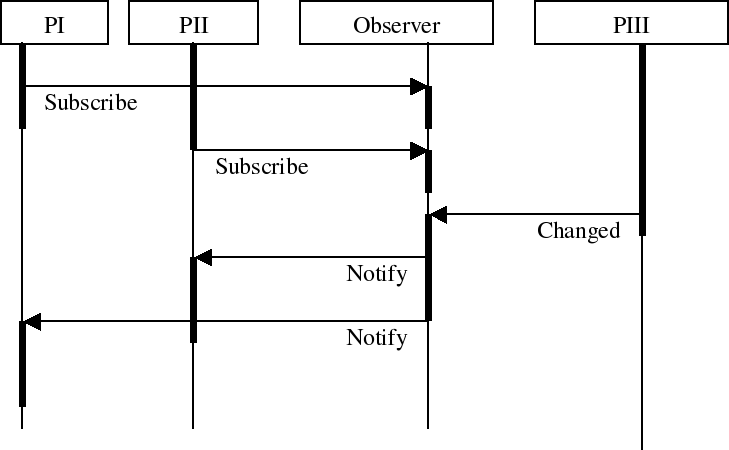 The observable component is a simple implementation of the 'Observer Design Pattern'. The implementation itself requires some fine tuning, which will happen in the future. Below is an MSC and the current code. Most of the time, the code written is untracktable. This means that we cannot predict at compile time how many times a loop will execute. Even if we can predict how much time it takes to handle a message, we still have the problems of loops between components which cannot be described. The component system forbids thunks with an infinite execution time. As such we can time the behavior of most of the thunks. If we work with a testset which acompagnains a component, we can easily run the component on the target architecture and get some measures for its execution time. The problem of message loops between one, two or more components can be tackled by integrating all these interacting components into one single component with its own testset and timing data. Currently there are no loop components available, but as the projhect continues these will be necessary. Now that we know how we can write components, its time to look at the Component System. The Component System is the runtime environment in which components are executed. This means that the component system takes care of scheduling messages, handling interrupts and distribution. Of course, its almost quite impossible to deliver a component system which is small scaled and does everything you want. This is the reason why most of the behavior of the component system has been made pluggable. For example, we can instantiate a new scheduler and plug it into the component system, or we can add a new message handler to print message traces between components while we are developing the software. At the moment we push it into the embedded system we can choose smaller schedulers or smaller message handlers. A good example of this is the possibility of using a multi threaded scheduler on a large scaled system and a single threaded scheduler on a small scaled embedded system. The component system allows us to design an application regardless of how many threads will be used when executing. If we run the application on a larger embedded system we may find ourselves using 10 to 20 threads. But if we run the same application of a small scaled system, we may find ourselves using only one thread. In the limit it is even possible to eliminate all uses of threads from the Component System, without endangering the correct execution of the program. Now, let us have a look at how the component system can be instantiated with different plugins. The component system is written in Java, meaning that we always have to write a main program, which instantiates the runtime component system and which boots up a number of standard components. Initializing the component system should be the first thing done in the main loop of the program. It should be noted that there is only one instantiation of the component system which should be initialized at the start of the program. This should be done by calling the init method on the ComponentSystem class. After we have created the component system we have to assign a scheduler to it, which will be used for the rest of the running time of the application. If you want to use a standardScheduler with <x> number of threads, you can create such a scheduler and pass it to the ComponentSystem. Now, suppose we also want to add a new message handling strategy, which prints a line for every message handled, we could plug in a TracingMessageHandler. Finally, when all plugins have been installed, all we have to do is start the Component System, by calling the start method. When the component system has been started we can start adding some interrupt handlers, so our application becomes reactive to the rest of the world. For example, suppose we have to add a SocketInterruptHandler and a TimingInterruptHandler. We can simply do this by creating these components. The first two lines create a SocketInterrupthandler, so from now on our application will be able to respond to incoming socket calls. This interrupt handler is from now on known as "Socket8080" and the HttpdDaemon has been subscribed to this interrupt/socket. The last three lines create a TimerInterruptHandler which will send a notification to the "ConduitRunner" every 5000 ms (or 5 s). Of course before we can subscribe components like ConduitRunners and HttpdDaemons we have to construct them, in exactly the same way. After initializing all the components the static main method should finish. The complete logic of the program should be in components. The main exists only for 'glueing/instantiaton' purposes. Now that we know how we integrate the component system into our application, let us have a further look at the internals of the system. The complete component framework and the interaction between components is message driven. Writing components in a event driven requires sometimes the ability to override the standard message behavior. For example, if we want to glue some components together we definitely don't want to compile stubs every time. On the other hand, the component systems standard message delivery can be inadequate and may require new plugins to deliver messages. For example, if we want to add 'channels' or 'connectors' between components. A.messageHandler.sendMessage() will be the component system if no special messagehandlers are installed. ComponentSystem.sendMessage() will call the Scheduler to schedule the message. Whenever the scheduler decides to execute the message, it will look up the component its messagehandler and call handleMessage. The MSC below is the same trace from executing the sendmessage to receiving the message at component B if two messagehandlers are installed. Now, if we want to write our own message handlers we encounter a number of odd issues at first sight. For example, do we want that all components have the same message handler or should we be able to differentiate on this. It would be nice to write a debugging message handler which keeps track of all messages send from component "A", "B" and "C", but not from the other components. If would be very nice if we were able to write a message handler factory which created the right message handler for the right component. Luckily this is possible. Whenever we plug in a new Message Handler into the component system, we actually put in a new messageHandlerFactory, which in its turn will or will not create a new MessageHandler object for every component instantiated. All a messagehandler factory has to do is to create a messageHandler for the component with name <componentname>. The freshly created MessageHandler should receive <nxtHandler> as its message handler. The handleMessage method should do whatever the message handler wants to do with the message and afterwards deliver it to its own messagehandler (which he should normally know, when creating the message handler a <nxthandler> field is passed, which can be stored, or ignored). The sendMessage method can also plug in some debugging code, but should also send the message to its own messageHandler. This message handling system may look complicated, but this is only when creating components. Once created, we have a direct chain of message handlers which call each other, without unnecessary messagehandlers stored in between. In practice, message handlers are not too hard to write. Below are three examples. The first example is the standard message handler (the Component System itself), the second example shows how we can print a trace of messages and the third one shows how we can time message traces. Below is the code of the standard Message Handler. The standard Message Handler (which is the Component System) is the endpoint of messages which are being send and is also the endpoint of messages which should arrive. When sendMessage is called we will call the current scheduler and schedule the message for execution. From now on it's the schedulers task to resurrect this message and deliver it by calling handleMessage upon the component's messageHandler. Whenever handleMessage is called, we will retrieve the destination of the message (getTarget()) and ask the target (the actual component, not its messagehandler) to handle the message. HandleMessage:1 retrieves the target of the message. (the component we want to reach). handleMessage:2 starts creating a rule which looks like "<targetname>.<targetinvocation> ->". This rule will be expanded further by the next line. 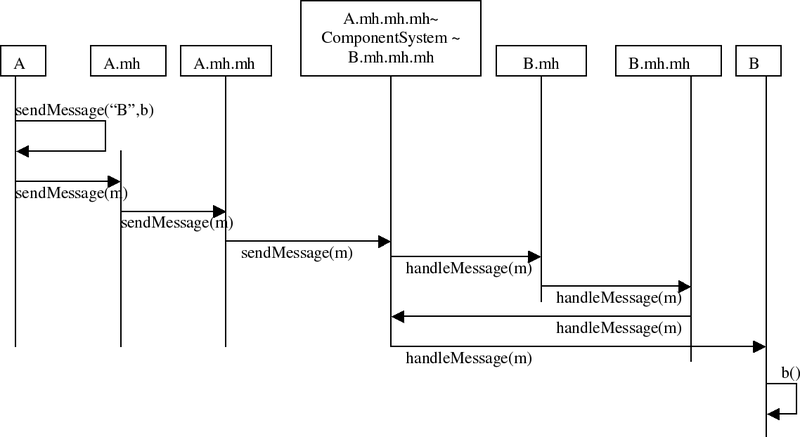 handleMessage:3 invokes its own messageHandler in which directly or indirectly messages will be send. These messages are caught in sendMessage and appended to the currentRule. Finally, in handleMessage:4 we print out the rule we observed. SendMessage:1 checks whether the rule is empty. This is needed because sometimes a message can be send from within a component without being a response to another message. This is the case for InterruptHandlers and the ComponentSystem. (the Init message for example). SendMessage:2 expands the rule by appending the send message to the current production. SendMessage:3 calls the next messageHandler to deliver the message. These two things are quite simple, nevertheless, because we have to keep track of a rule for every component handling a message, we need a separate message handler for every component. Hence, we need to write a messageHandlerFactory which instantiates a TracingMessageHandler. We wrap up the description of messagehandlers by giving a bigger example of how we can time messagehandling. The way this is done resembles the way the TracingMessageHandler works, except that we put all the timings in one object. Of course, before we can do so we need an abstraction which keeps track of time. This method should return immediately after scheduling the message for execution. This method should never wait until the message has been processed. At a certain moment in time the scheduler will decide to execute a message. He can do this by calling the execute method upon the message. This method will only return when the message has been handled. The execute method will look up the components message handler and call handleMessage upon it. The component system, when started, will call start upon the scheduler. The scheduler start method currently returns the execution, but it is possible/probable this will change in the future. The component system is delivered with two schedulers. One illustrates how we can write a stupid scheduler, which behaves incorrect. 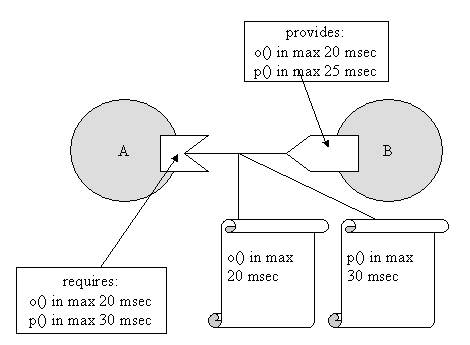 The second scheduler is a simple FIFO scheduler which behaves correct. (as described in the section: Advanced Message Passing). We will now illustrate both schedulers since some of its classes may be reusable to implement a faster scheduler. The standard schedulers work with a Queuing system with 1 inQ (messages scheduled for execution) and a number of outQs (One queue with execution loop for every possible thread). The run method decides which message (from the inQ) should be placed on which outQ. The queue serves a a concurrency controlling mechanism (provider consumer). At one end the scheduler puts in the messages, at the consumer end we execute the messages. The Executionloop is obvious. It pops a message from its associated Q and it continues. If there is no message available the Q will automatically make the execution loop wait. The MessageQueue controls the concurrency which can be used to implement a synchronous receive at consumer side and an asynchronous send at producer side. In other words: the add is asynchronous and puts a message in the Q, while the pop blocks if there is no message available. * returns whether the receiving end of the Q is busy with target. * for target. Doesn't take the busy With into account. The stupid scheduler is an illustration of a incorrect scheduler algorithm, which nevertheless looks fine. So beware ! When a message is schedule for execution it is placed in the incoming Q. The run method pops a message of the Q and continues and chooses the first outQ to deliver the message to. This looks like a good working scheduler but it violates the semantics of the component system. The component system should implement FIFO channels between components: If component A.a() sends two messages B.b() and B.c() in this order. These messages should be delivered in this order at component B. It is possible that this scheduler violates this constraint. Furthermore it is also possible that a component runs concurrent with itself, which is also not allowed ! Below is the standard scheduler used by the component system. This scheduler preserves the fifo semantics between components. This code illustrates how difficult it is to write a correct scheduler. Have a look at the synchronized outQ. This is absolutely necessary because between the check whether the Q is busy with message m and the check whether message m is in the Q can be a change of state of the Q, returning 'false' when he is in fact busy with the message m.
* bruikbaar om ComponentMessages af te handelen. This section describes a possible scheduler for the component system. The scheduler is priority based and schedules messages based on their absolute deadlines. Messages with early deadlines are executed first, as such it can be classified as an Earliest Deadline First scheduler. The link to the component composition approach with its contracts is also shown, since it was already stated that contracts would have a runtime meaning. It this appendix we only show Timing Contracts, because they are related to the scheduling of messages. These Timing Contracts are monitored by Message Handlers. Message handlers see the messages an associated component sends and also the messages it receives. 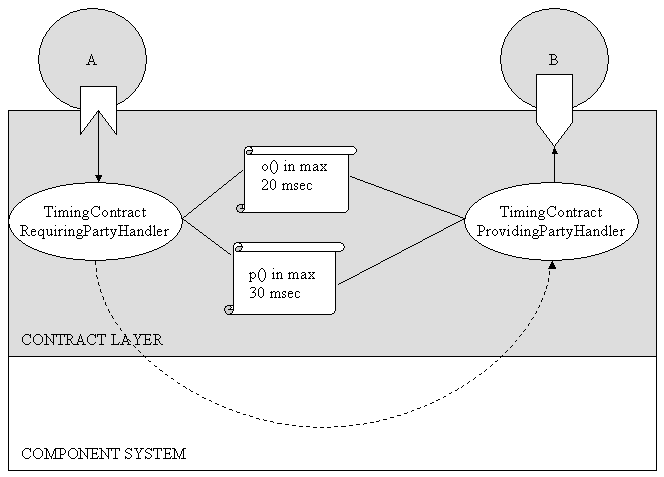 This section presents two message handlers related to Timing Contracts: a TimingContractRequiringPartyHandler and a TimingContractProvidingPartyHandler. These handlers are responsible for monitoring the Timing Contracts between two components. To schedule messages based on their deadlines extra information is needed. This extra information comes from the Timing Contracts and is issued by using hidden (or extra) parameters. Suppose one has two components (A and B) connected to each other. Component B offers an operation o() to A. The specification of B specifies that o() will be processed in 20 msec. Suppose now that A agrees with this specification. Since there is an agreement, a contract can be created between both parties. This contract is called a Timing Contract. Recall that such a Timing Contract consists out of 323 parameters, but for this example we will only look at one possible parameter: maxEndTime. As such, the contract between A en B for operation o() has a maxEndTime of 20 msec. Recall that this maxEndTime is relative to the submission time of the message. The contract creation has to be performed by the component composition tool. Once the application has been composed, the tool has to generate code for the support of these Timing Contracts. Therefore we use a TimingContractRequiringPartyHandler which is connected to Component A. 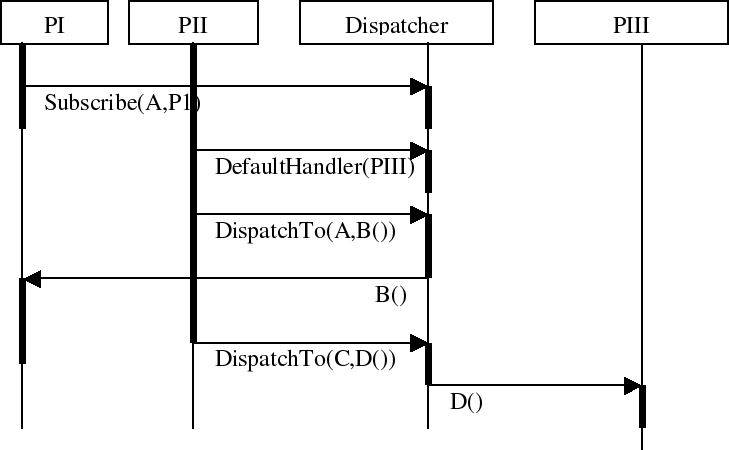 There is also a TimingContractProvidingPartyHandler which is connected to Component B. Both handlers share one object: an object representing the contract for operation o() between A and B. In this object, the maxEndTime is stored and can be retrieved by both handlers. Since the component A can communicate with different other components, through different ports, it could be possible to have different Timing Contracts. Therefore every TimingContract handler is coupled to one port of the component. As such if component A would be connected to a third component C, also with a Timing Contract, component A will have two TimingContract handlers. At runtime, component A will have exactly one TimingContractRequiringPartyHandler and B will have exactly one TimingContractProvidingPartyHandler. There will be two Timing Contract objects: one for o() and one for p(). These two handlers reside in the Contract Layer, which is a support layer for the managing and monitoring of contracts. This layer is on top of the component system. See also the next figure. The TimingContractRequiringPartyHandler (abbreviated in the remainder of this document as TCRPH) will intercept messages sent from A to B. These messages will be o() or p() messages. When A sends one of these two messages, TCRPH will look if there is a contract for this message. If this is the case, the maxEndTime of the message will be appended to the message (by adding an extra field “TIMING.MAXENDTIME” to the message) and a value indicating the maximum end time in msec. Another field will also be added: “TIMING.SUBMITTIME”. The value of this field indicates the absolute time at which the message was received by TCRPH. Remark that the value of TIMING.SUBMITTIME added to TIMING.MAXENDTIME equals the absolute deadline of the message24. There is also the possibility to add another extra field: “TIMING.PRIORITY”, but this is not used by the Timing Contract message handlers. After that, the message can be send: it is intercepted by the component system that sends it to the scheduler. This scheduler is an EDF scheduler, which sorts messages based on their absolute deadline. It executes the messages with the earliest deadlines first. Once when the message from A is available for execution, the corresponding operation on B is performed. After termination of the operation, the current time is calculated by the TimingContractProvidingPartyHandler (abbreviated TCPPH). If the current time is greater than the absolute deadline of the message, then the deadline was not reached. TCPPH could send back a notification to TCPRH, but in the current implementation TCPPH only logs this information. As explained in the previous section, the scheduler receives messages with two extra fields: TIMING.MAXENDTIME and TIMING.SUBMITTIME. The TIMING.SUBMITTIME specifies at which time the message was posted and the TIMING.MAXENDTIME how long the message is allowed to take before the end of its execution. A third parameter TIMING.PRIORITY is also allowed, but it is not yet used. As such, there is only “one” priority in our current implementation. The scheduler is a priority-based earliest deadline first scheduler. It is a soft-realtime scheduler that does not take into consideration priority inversion issues. The number of priorities of the scheduler can be selected when the scheduler is created, but take into consideration that there will be one thread per priority. Every thread will have a different priority, so it makes no sense to declare more priorities than the available thread priorities. A later extension of the scheduler could allow threads of equal priority. 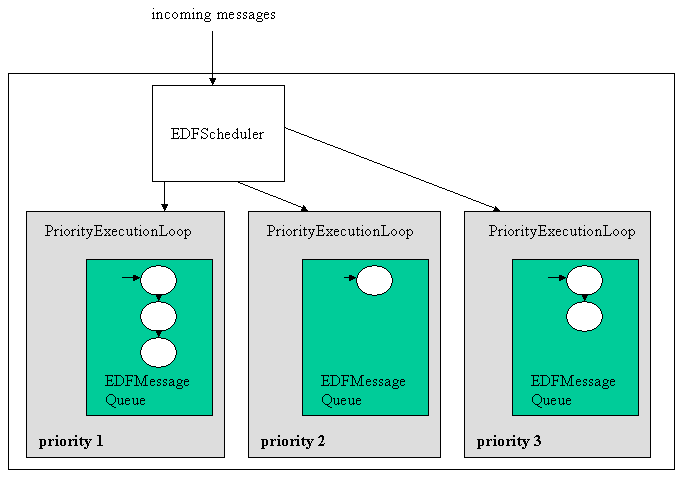 These threads are called PriorityExecutionLoops and their purpose is to execute messages that are posted in their associated EDFMessageQueue. This queue receives messages from the EDFScheduler, which is the “root” class of the scheduler. When the EDFScheduler receives a message, it first looks at the associated priority. This priority tells in which queue the message has to be put. After that, the EDFMessageQueue is responsible for sorting the message based on its absolute deadline: early deadlines are sorted at the start, late deadlines at the end. The PriorityExecutionLoop pulls out the message with the earliest deadline, executes it and pulls the next message out of the queue, and so on. The next figure represents the scheduler with three PriorityExecutionLoops, each with a specific priority. Every PriorityExecutionLoop gets messages from a local EDFMessageQueue. Messages are put in the queue by the EDFScheduler. Recall the example given earlier in this document: two components A and B are connected to each other. 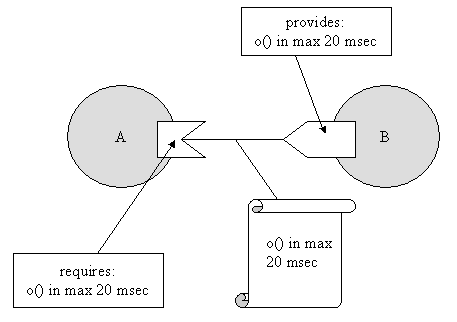 B offers two operations to A: o() in 20 msec and p() in 25 msec. Component A requires the execution of o() in 20 msec and the execution of p() in 30 msec, so two Timing Contracts are made: maxEndTime of o() is 20 msec and maxEndTime of p() is 30 msec. public void start(), this methods starts the scheduling service. It can be used to initialize the scheduler (for example: the creation of threads). 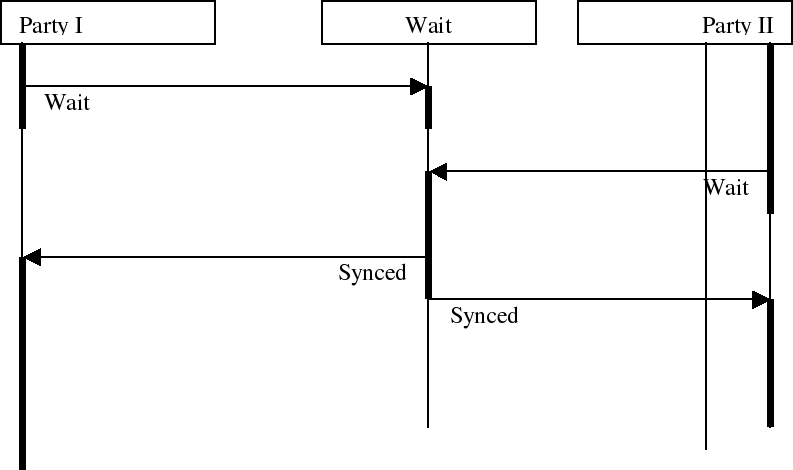 public void scheduleForExecution(Message m), this method is called by the component system when the scheduler has to schedule an newly arrived message. Once the EDFScheduler is plugged in, and started, the components A and B can be loaded and initialised. Loading component A and component B also means that their associated message handlers are created. In our case, one TCRPH and one TCPPH will be created. Also, two contract objects will be created: one for o() and one for p(). These contract objects will be attached to the created TCRPH and TCPPH. Suppose that A wants to send o() and immediately thereafter also wants to send p(). When sending o() the TCRPH annotates the message with TIMING.MAXENDTIME and TIMING.SUBMITTIME and passes the message to the Component System. As a result the Component System calls scheduleForExecution() on the scheduler. The scheduler puts this message in a EDFMessageQueue. Now A sends p(), and the whole process is repeated. The scheduler will put p() after the message o() in the queue because the deadline of p() is after the deadline of o(). Suppose now that there are two other components C and D. Component C wants to send a message q() to D with a Timing Contract of 10 msec, at the same time26 A sends o() and p(). Then, when C posts the message to the Component System, the scheduler will put this message before o() and p() because its absolute deadline is earlier. check which data structure is best for the scheduler. Messages have to be put in a queue. If a list is chosen, the insertion of a message could take a while. If an array is chosen, what happens when more messages arrive than the maximum length of the array? And how can a message be inserted in an array if there is no room between two cells? Currently a list is used. We are also developing an EDFScheduler that uses a combination of an array and a list. The array is used for early deadlines, the list is used for late deadlines. reservation mechanism. The EDFScheduler only offers a best-effort service. An extension would be the addition of a reservation mechanism: this would enable the reservation of some “time slots” for a component. It would then be easier to guarantee a specific execution time. poor time resolution of the JVM (and underlying system). a standard JVM on a Windows PC has a resolution of 10 msec. This means that when a component A sends a message on time t, then waits for 5 msec and then sends another message on time t + 5, the component system could still see both messages as being sent at the same time. This is due to the hardware/OS dependent precision of the java call System.currentTimeMillis()27.
priority inversion. If the scheduler uses threads with different priorities it could be possible for a lower priority thread to block a higher priority thread due to the locking of system resources or objects. Priority inversion however will only occur frequently if two components use extensively the same data structure, which could indicate a design flaw. call semantics of the component system. Recall the semantics of the component system: when two components A and B directly send a message o() followed by a message p(), these message have to arrive in order. A mechanism for supporting this is not explicitly built into the scheduler, since p() can only be executed before o() if the maxEndTime in the Timing Contract associated with p() is less than the maxEndTime in the Timing Contract associated with o(). But this is a design error: one cannot suppose o() to be executed before p() if the deadline of p() is before the deadline of o()! However, if an explicit checking is needed, this should be included in a Synchronization message handler. This message handler has to control the correct arrival of messages. If one message is out of order, this one has to be cached until the correct message is received. To know the correct order of messages the Synchronization message handler could use the synchronization specification of the component interface (level 3 of the component interface). A problem that often comes back, is the lack of component reuse over several projects or development teams in a company. To make reuse possible, components have to be defined in a formal way to eliminate misinterpretations. Without a clear definition, we cannot talk about reuse - because we don't even know what is reused. That's why the definition is quite formal on some points. Some parts of the definition have still to be filled in, for example the languages that will be chosen to specify semantics and synchronization are still an open issue. It is also important to notice that a clear definition doesn't imply the correct use of components. To use and reuse components a method is needed. This method should enable the discovery of reusable components. A general guiding rule is the high cohesion - low coupling rule. High cohesion means that when one develops a component he should only put functionality in it that is related. A component that does everything is not reusable. Low coupling is also needed between the different components. If low coupling is not maintained, the involved component cannot be reused without also deploying the other components to which it is coupled. This also breaks reuse. To summarize, not only a good definition is needed, but also a good method. A second argument in using a component system is the ability to use a very open meta level architecture. As demonstrated throughout the tutorial, we can write glue component very easily. Two reasons for this are 1) we don't wait for other components 2) we have a very explicit message handling service, which can be tuned by glue components. Besides the advantages shown above, the component system also has additional advantages for embedded systems. The component system helps in debugging the developed software: it can intercept the sent messages between the components. This enables logging of messages or events together with timing information, which can help the debug process. As stated previously, the component system can also check if the components adhere to what is specified in their outside view. Another advantage of using a component system is the shielding from the hardware. This facilitates reuse of components, because they are not too dependent on hardware anymore. Though, if a specific piece of hardware needs to be used, it could be encapsulated in a component. When a component needs this hardware, it will communicate with the associated component. In fact, only the interface is important. In some cases, when the hardware changes, it is possible to retain the interface. In that way the dependency of other components on the hardware is not broken. A precompiler syntax for creating components. Together with this we need the ability to pass parameters to the Init message. The precompiler should be able to declare components extending from classes which does not inherit from 'Component'. Put a transparent distribution layer into the component system. The Component-System Component: It can be an advantage to do the interfacing to the component system as if it were a component itself. This has the advantage that whenever we work in a distributed environment the component system can always be reached with the same identifier. Another advantage is the possibility of tuning the component system with a larger, more manageable component system-component, which will be removed in the production version of the system. Introspection/Reification & Absorption: Introspection is needed whenever we are faced with dynamic components that want to change their name at runtime, dynamic components that look for their communication partner in the system and components which change their behavior at runtime. The possibility for remote/runtime uploads depends heavily on this feature. However it may not be necessary to create a full reflective system in which we can absorb certain kinds of primitives and workings into the component system. Investigate the Scheduler of the KUL. Investigate the possibilities of Record/Replay facilities Gent. Declaring the used message fields in a thunks header. This allows more straightforward rule-generation. The precompiler should output some nice indented code, not the flat line format it uses now. Profile it on the target architecture. Together with this we need to remove the TreeMap from the source because Kaffe has a wrong implementation of this standard Java class. 1- For example, database applications written as if they are standalone programs will receive a message and send an answer back to the caller some time later while the originating component can do other things. Written in the other way, the database component will block the sender which is not reusable without writing adapters and other middle ware. 2- We actually don't have to copy the evnt. We can treat the event as read-only or we can transfer ownership upon the event from one component to the other. 5- When using the term 'version' here, the 'implementation version' of the component is meant, not the version of the component's interface (like COM). Currently the component system has no explicit versioning support. 6- This direct mapping from name to reference simplifies dynamic binding. (as described in the 'Component Working Definition' deliverable. 7- It may look a bit overkill to have such a strict naming convention but it is absolutely necessary since we have no compile time name checking algorithm. So, there is a difference between HttpdInstance and HTTPDInstance. 10- Notice that the first method is preferred because it allows us to do java-compile-time checking. If we are smart we define all the component instance names as static final string constants somewhere. 11- In the future we will probably add some wrapper-invoker which actually calls the messages with correct object names. 13- As a side note, the Return field is automatticaly filled in by the component system. Return is passed as a field in the incoming message. 14- This may sound as splitting hairs but it is not. If we work in a distributed environment this means that we don't have to pass these extra objects over the cable. 15- In the future we will probably make use of three kinds of messages. The first one will be called 'Init' (without fields) to initialize the component to a certain state. The second one will be called 'Setup' with any parameters passed to the createComponent method, and the last one will be called 'Reset' which will bring the object back to a certain state. 16- I have to admit that the terminology was not entirely clear. 17- In a latter stage we may add some timing behavior of these kinds of active messages. 18- We know that the current delivery order is a messy thing and we hope to use (misuse) the hidden parameters to specify some kind of order or priority on the messages which are being executed. 21- Please note that this wait component is far from being complete, nevertheless it gives an idea how we can synchronize components with each other. 22- It could be possible to print bit by bit the production on the screen, but this is barely readable if we start the component system using a number of threads. 23- These were maxEndTime, minStartTime and maxStartTime. See also D 3.2.a. 24- Of course, this is only true if no time elapsed between the sending of the message by component A and the receiving of the message by TCRPH. 25- Every scheduler has to implement this interface. 26- “At the same time” means here: before the elapsing of 10 msec after A sends o(). If q() is send after these 10 msecs, then the absolute deadline of q() will be later than the absolute deadline of o() and as a result q() will be scheduled after o(). 28- This is completely impossible if we would write the software in a process-based way instead of an event based way.